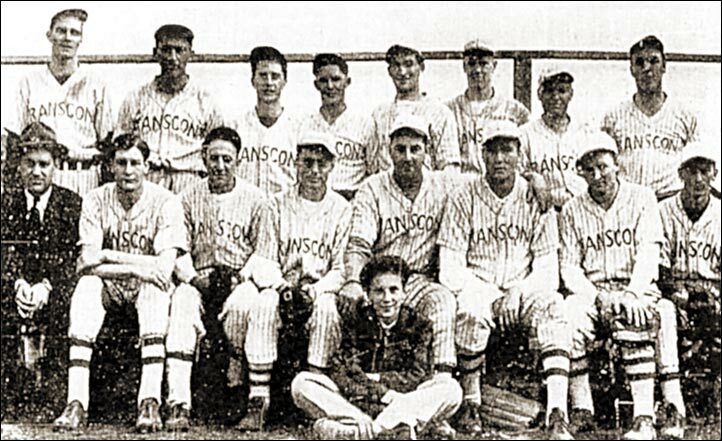 The 1941 Transcona Railroaders finalists in the Winnipeg Senior League . Back row (left to right) - A.Laing, P.Rizzuto, J.Atkin, Mike Moroz, Joe Teres, C.Gardiner, Aime Pageof, Gerald Marcotte. Front row - W.Kerr, Bill "Slim" Nicholson, Midi Blacquiere MGR, N.Glowa, Mike Zawley, Carl Lehman, Albert Lamoureux, Joe Osinski. In front - R.Smith (Mascot).